Ancient pilgrim routes such as The Way of St James to Santiago de Compostela, Spain, report an 10% increase in numbers annually, particularly among non-religious groups. Harnessing this increased popularity to protect natural and cultural heritage is a common challenge faced by those responsible for Europe’s major pilgrimage routes. 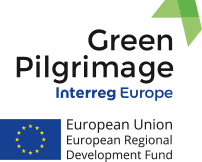 Green Pilgrimage will show policy makers how to protect natural and cultural heritage whilst developing jobs and growth along pilgrim routes by developing low impact tourism, digitalization, pilgrim accommodation and strengthening local traditions. This reconnects pilgrims with their environment, landscape and culture. Find out more about the Green Pilgrimage project. Green Pilgrimage will provide an evidence base to regional policy makers. It will show Green Pilgrimage as a social and economically valuable cultural heritage tradition that enhances and develops Europe’s natural landscape and cultural assets. The best way to protect nature and heritage is to give it economic value in a way that enhances the very heritage that we seek to protect. This requires addressing the different types of policies that impact on natural and cultural heritage. develop Green Pilgrimage action plans that enable the development of natural and cultural assets through sustainable economic growth. growth policies that both develop and protect natural and cultural heritage. evidence base to enable further funding to improve pilgrimage and long distance walking infrastructure.